The definition of salt is NaCl. Na sodium, Cl chloride. Both of these are minerals. Anything else in the salt may be another mineral or any other adulterant. Uses for salt go beyond that of baking chemistry and food flavor. It has a number of other additional uses. 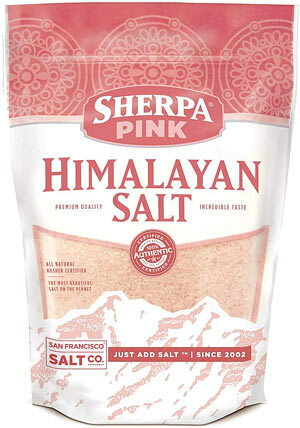 By the way, we love this salt! Add a pinch of Salt to the coffee in the basket of your coffeemaker. This will improve the coffee’s flavor by helping to remove some of the acid taste. It works! To help remove odors from garbage disposals, pour 1/2 cup of Salt directly into the garbage disposal. By running the disposal following manufacturer’s directions, you’ll send those odors down the drain. Removing fish odor from your hands is simple with Salt. Just rub your hands with a lemon wedge dipped in salt, then rinse with water. To help cut odors off of your wooden cutting board, simply pour a generous amount of Salt directly on the board. Rub lightly with a damp cloth. Wash in warm, sudsy water. To alleviate the discomfort of a mild sore throat, gargle several times daily with a mixture of 1/4 teaspoon Salt and 1/2 cup warm water. It’s like taking a liquid lozenge. 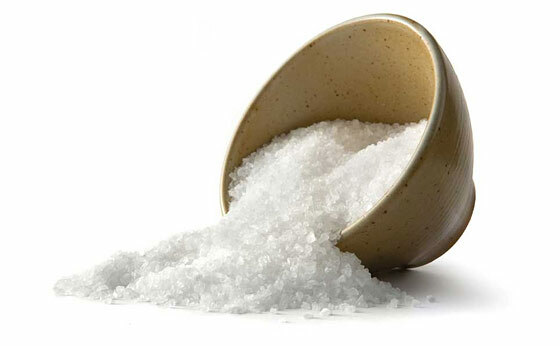 To prepare a salt water bath, pour 6 quarts (1-1/2 gallons) warm water in a large basin. Mix in 1/4 cup Salt and 1/4 cup baking soda. Soak feet for up to 15 minutes. Eggs boiled in salted water peel more easily. Place the egg in a cup of water to which two teaspoonfuls of salt has been added. A fresh egg sinks; a doubter will float. The greasiest iron pan will wash easily if you use a little salt in it and wipe with paper. Rubbing with salt will remove stubborn tea or coffee stains from cups. To remove pinfeathers easily from a chicken, rub the chicken skin with salt first. To prevent mold on cheese, wrap it in a cloth dampened with saltwater before refrigerating. If stung, immediately wet the spot and cover with salt to relieve the pain. Occasionally throw a handful of salt on the flames in your fireplace; it will help loosen soot from the chimney and salt makes a bright yellow flame. A dash of salt added to the water in a flower vase will keep cut flowers fresh longer. If weeds or unwanted grass come up between patio bricks or blocks, carefully spread salt between the bricks and blocks, then sprinkle with water or wait for rain to wet it down. Mix three pounds of salt with a gallon of soapy water and apply to leaves and stems with a sprayer. Sprinkling a little salt in canvas shoes occasionally will take up the moisture and help remove odors. If a pie or casserole bubbles over in the oven, put a handful of salt on top of the spill. It won’t smoke and smell, and it will bake into a crust that makes the baked-on mess much easier to clean when it has cooled. Sprinkle a little salt on a piece of paper and run the hot iron over it to remove rough, sticky spots. Sprinkle salt at doorways, window sills and anywhere else ants sneak into your house. Ants don’t like to walk on salt. Use one part fine salt to two parts baking soda–dip your toothbrush in the mix and brush as usual. Sprinkle salt on snow or ice to melt away. Sprinkle salt in skillet and scrub. Just wet hands with water, sprinkle salt on your wet hands, rub hands together as if washing them, and rinse…smell is gone. Sprinkle salt to kill snails. Wet hair, apply shampoo, pour few tsps. salt on head/scalp. Rub vigorously with finger tips. Rinse well. 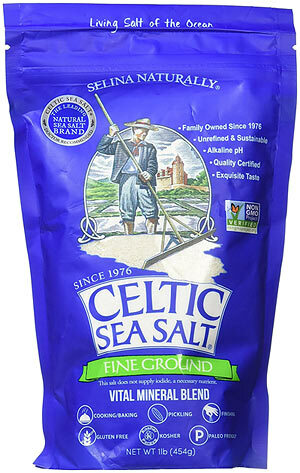 Use this salt (or equivalent) with a ‘neti pot’ to clear sinus /nasal passages. Epsom salts for soothing cleansing bath and muscle relief. It’s a very old way of preserving meat by packing it in salt. Type of salt, oil, essential oil just personal preference. Thanks Ken! I’m going to try the pinch in the coffee basket tomorrow! Great many uses for something so inexpensive! If you’re drinking ‘cheap’ coffee, it especially helps! The Human body MUST have an amount of NaCl among a LOT of other minerals. Also it is very important for Hydration. SO in keeping with the Article, one must have an ‘intake’ of Salt. I personally like Redmond’s Salt out of Redmond, Utah. I happen to buy it locally in 25pound bags and re-package it. Also stock a LOT of Canning/Pickling Salt. Toss a pinch of salt over your shoulder for good luck. It must be tossed by your right hand over your left shoulder to have any impact on the misfortune that the spill entailed. Otherwise you are doomed! Doomed I tell you. Yep, you need salt to live. Not enough of it you will die. Too much of it will kill you. Got to have a happy balance. Two days of the year every ER in the country sees more people in with problems from congestive heart failure. Thanksgiving and Christmas. Holiday feasting frequently leads to an excessive salt intake. Water in your body is in 3 places. In the cells, in the spaces between the cells and in the blood. The more salt you eat the more fluid you will retain. A lot of that fluid is going to be pumped around. It is going to pumped everywhere. Some of it is going to be pumped down and some of it is going to be pumped up. Typically the water (in the blood) being pumped through the legs is going to a harder time of it. That excess water being retained in the spaces is causing your lower legs to swell. That causes excessive pressure and as we all know pressure is equal in all directions so when it is swelling out it is also swelling in. Now the pump is being made to pump the fluid through pipes that are being squeezed. This builds up pressure. Some of the water in the blood is leaking into the tissue which only makes the swelling worse. But wait, it gets still worse. That build up of pressure causes blood in the lungs to wait before it can get pumped out into the body. Water leaks out of that blood into the lung tissue and there is less space for air to get the oxygen in. Shortness of breath occurs. The water in the the tissue is affected by gravity. It “flows” downhill. This is why the the swelling tends to be most noticed in the feet and ankles. We can also hear it in the base of the lungs. For the farmers out there imagine you are going to irrigate a couple of fields. One field is 4 acres, the other field is 5 acres. You go down to the irrigation supply house and buy two identical pumps. Each field is going to take one gallon an hour per acre. So one pump is going to pump 4 gallons an hour the other pump is going to pump 5 gallons an hour. Which pump is going to wear out first? Simply said, extra salt on your food causes extra work on your heart. And yeah, I too also pick up the salt shaker on occasion. Just don’t do it regularly, your heat will last longer. Bit of a rant and I do have a little more to say but other business needs attending to. I’ll add more later. Concur! My expertise is not in the bullets or the beans but I do enjoy learning more from those who do know more than me. Back to the salt heart thing. It is normal for hearts to wear out along with every other part of our bodies. One of the early signs is swelling in the lower extremities. If it is happening cut back on the salt. It will be worse during the day because that fluid in between the cells flows downhill. At night when we are sleeping our legs are higher and the fluid tends to even out. As a bit of an aside, carpal tunnel is worse at night for the same reason. Fluid pressure is increasing in the hands and putting more pressure on the nerves because the arms are no longer higher than the legs. If your socks are leaving marks you’re starting to retain fluid. It is happening to me and you can think of this as wearing loose tourniquets on your lower legs. I’ve started wearing ankle high socks as they are less constrictive. A later sign is waking up short of breath (PND, paroxysmal nocturnal dyspnea). Orthopnea is shortness of breath when supine. Rales are the sounds heard in the base of the lungs when fluid is accumulating there. Rub some of our hair together next to your ears and the crackling sound you hear is what it sounds like with a stethoscope. In the ER we would routinely ask if folks were sleeping with pillows under their shoulders or in a recliner. A bit of elevation helped get the fluid back down to the bases of the lungs. Opening up the the top of the lungs gets more oxygen in. if you are having these symptoms talk with our medical provider about them and cut way back on the salt. Cutting back now is part of preventive medicine. Now on the beans. Anyone have any good recipes for navy bean soup? Dump it all into a Crock Pot and cover with Filtered Water. Cook till the Beans are soft but NOT mushy. I like to add a little HOT HOT HOT Thai peppers just to spice up life a little. Serve with some fresh baked Corn Bread, and a cold Homebrew. Why in the world would you want to “soak the farts out? Nothing more satisfying than ripping a good one out when you’re waiting on the wife, inside her beauty shop, as she and her women friends are deep into the daily gossip. Or more helpful when the wind shifts on you when stalking a deer. They figure you for at least a week dead and ignore you. 😂, more like the Sensi of Farting. So many lines, too little time….thanks for the laugh. Brining meats for moist flavor. Depending on how much meat u r doing, 2 to 3 Tablespoons added to a quart of water for 2 to 3 chicken breasts or pork chops. 30 min to 4 hours is the sweet spot. Cooks illustated did a test , up to 24 hours in brine. No difference in 4 hours compared to up to 24 hours in brine. Since I have been doing this my chicken is Never dry anymore. I use kosher salt for brining and citrus rinds and juice. At first signs of a sore throat, gargle with 3 TBS salt in ½ cup warm water. If I get too aggressive in flossing, I will also use this as a mouth rinse. Great for the gums. Have a meeting or event and a runny nose? ¼ TBS salt then fill rest of spoon with water. Snort and it. Should be good for about an hour. Fresh water for the body; salt water for the soul. Beach’n I know you hear me. I do hear you! We’re actually thinking about looking for property more inland…maybe near a fresh water lake. Bass fishing! Mentioned before that I mix many salts together in my salt cellar. This way you can benefit from the many different minerals. Also most of the salts have less sodium and more flavor than regular round boxes of salt. I do mix some iodized in too. My new favorite salt is from out Tommyboy’s way. Black volcanic salt. HOWEVER it has more sodium than any salt I know of!!! Which became apparent very quick. Wow my ankles were a bit puffy. Emailed the vendor and it had more than 800mg per 1/4 tsp. Tasty but go easy. 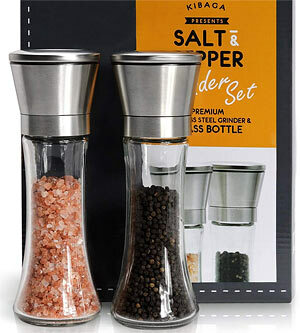 One year gave a foodie family member black salt and white pepper for Christmas. Made a great conversation piece in the kitchen. Haven’t seen him post in along while. Hawaii got slammed with some poor weather. Power outages because of high winds. Don’t worry, old Tommyboy is just fine. – Use with electricity and water to produce bleach for safe drinking water, laundry, or put a tablespoon full of salt in citrus peel for room deodorizer. – Actually, salt is one of the lesser-known commercial products from West Texas. We also use underground salt domes to store a lot of the nation’s strategic reserves of propane. In a SHTF situation, with no electricity. salt for preserving food, will be more valuable than gold. In history past, this fact has proven itself to be true. My Aunt Hazel would place her fresh killed chicken in salt water to pull the blood from the meat. Even now if I purchase a whole fresh chicken from a grocery store I use this process. AC, when I quarter up a deer I drop it in an ice chest filled with ice, water and 1 cup of salt and 3 cup’s vinegar to cover meat. It cool’s the meat quickly and draw’s the blood out. Some time’s I have to change the water the next day it draw’s so good. In two days a good size hind quarter will be 33 degree’s at the bone. Give’s me more time to process the meat. Old hog trapper put me on to this year’s ago. I have gotten where I do this to rabbit’s, squirrel’s and chicken’s. Domestic rabbit is too dry for me unless I brine it over night, make’s all the difference. Salt for preserving hides for tanning…. Make sure you store both iodized and non-iodized salt. Your body needs the iodine, but for curing/preserving it can leave a bitter taste. Non iodized for preserving meat! Ungulates need added salt in their diet, humans don’t. We have learned to make delicious meals without using salt or sugar, fresh meats and vegetables with lots of herbs and spices. I can’t eat restaurant food now, it is packed with salt and sugar instead of flavor and freshness. I have worked physically demanding construction jobs in the Texas summer heat for 50 years (and still going strong) and have never had a salt tablet, rarely heat stress, if you drink lots of water during the day and take care to drink more in the middle of the night you will not have much problem with the heat, and a couple or three beers after work give you plenty of salt. But you can’t store too much salt if you are prepping for TEOTWAWKI because it is the easiest and most reliable low tech method to preserve food. Careful on the lots of water. Water drunk or water intoxication happens from too much water. Water that you drink has to be excreted by perspiration, respiration and urination. By far, most of this is through urination. Although it may not have any salt in it when you drink it it will pick it from your body before it leaves. Hyponatremia is inadequate salt in your body and it can cause confusion and loss of coordination. Extreme loss will be fatal. Most of us have heard about college students joining fraternities and being hazed. Occasionally students die from being required to drink excessive amounts of water by their would be brothers. I do concur on the less salt in our daily food. It occurs naturally in most of the food we eat and it is rarely needed. It does sell food though. Then when your doctor advises you to go on a low salt diet you find out that the people selling the food charge you more to leave the salt out. Did anyone mention the salt covenant? I like the egg test. Sounds cool.